Now, for the first time ever, this valuable data will be released to the community and these researchers are coming to work with creatives like yourself to join forces and see what innovative solutions for social problems we can come up with. With China’s obvious size, diversity of ecosystems, and rising global importance, the solutions developed and implemented in this country will contribute to the world’s knowledge base and is an opportunity to lead the way for other developing countries too. How will we use technology to help people best understand the impacts of climate change and prevent its damage to our life, health, food, water, farming and natural resources? Join us for this unprecedented open innovation contest to find creative solutions to raise awareness and prevent climate impact - Let’s co-create solutions for climate change! 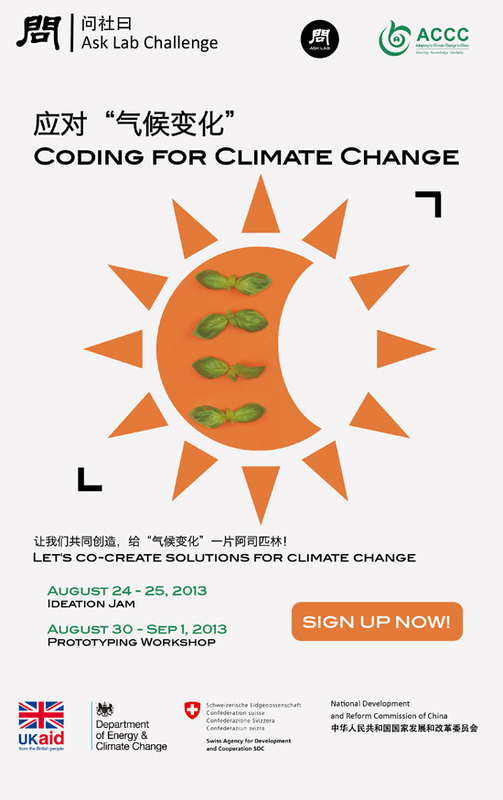 More information to come about “Coding For Climate Change,” including how to download the datasets, specifications/requirement of the event and other important background information, so please visit our Ask Lab website and sign up for the newsletter to get notified via email. como y que mi amor sea correspondido.